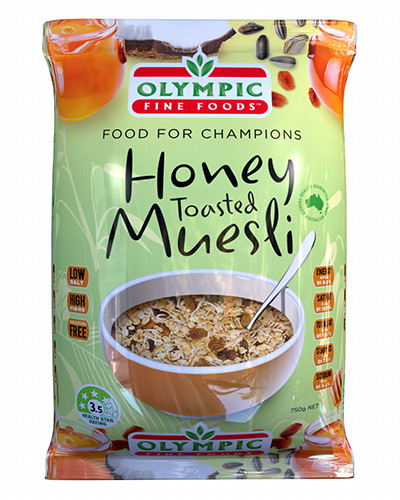 Olympic Honey Toasted Muesli is a selection of wholesome grains, seeds and fine quality dried fruits, mixed with premium 100% Australian Rolled Oats toasted in Natural Australian Honey, producing a delicious and nutritious tasting breakfast cereal. Oats, Sultanas, Vegetable Oil, Coconut, Honey (3.7%), Sesame Seeds, Sunflower Kernals, Sunflower Oil, Preservatives (220) *Some ingredients contain Sulphur Dioxide (220) to maintain natural colours and shelf life. Love our Honey Toasted Muesli product?